Inspired by the visit, he decided to act and the Darfur Dream Team Sister Schools Program was born. The program engaged students in the United States to act in order to support the education of their Darfuri peers living in isolated and under-resourced refugee camps in eastern Chad. Between 2008 and 2014, the program raised about one million dollars, which was directed mainly to primary school education for Darfuri refugees in Djabal and Goz Amer camps. These funds impacted more than 18,500 primary school-aged refugee children, 173 classrooms, and over 213 teachers. 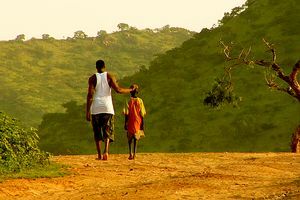 Click here to read McGrady and Prendergast’s 2009 piece on ESPN.com recounting their trip to eastern Chad.